Tennant Creek was named in 1860 after John Tennant, a pastoralist from Port Lincoln, South Australia by John McDougall Stuart, in gratitude for the financial help Tennant had provided for Stuart's expeditions across Australia. The town itself was declared in 1934, in the midst of Australia's last significant gold rush, and the gold industry became the driving force of the local economy. Mining has always been the backbone of the local economy, the Tennant Creek area contains many known deposits of gold, silver and copper. Tennant Creek is located on the Stuart Highway about 1000 kilometres from Darwin and 500 kilometres from Alice Springs at the junction of two great arterial roads, the Barkly Highway and the Stuart Highway, with a population of 3,500. The Ghan train line passes through the town and the infrastructure of the town is supportive for mining activities. The town has a diverse history shaped by Aboriginal culture, pastoralism and gold mining. The mining of gold, silver and copper has been at the heart of the local economy and at one point was the third largest gold producer in Australia. The opening up of the rich Tennant field, abundant in gold, marked the start of Australia's last great Gold Rush. In the decades since, Tennant Creek has produced over five-and-a-half million ounces of gold, making it one of the most productive gold fields in Australia. Climatic conditions throughout the region are semi-arid. Mean daily maximum temperatures range between 23°C in June and 39°C in December with mean daily minimum temperatures of between 7°C in July and 25°C in January. Annual average rainfall is between 600 mm in the north and 300 mm in the south. Rainfall is seasonal with 95 per cent falling between November and April. Red sand soils with a grey or brown sandy surface and red earths are the most extensive soil type covering large areas. Vegetation is almost exclusively open eucalypt savanna with eucalypt lacacia shrub lands to the south of Elliott and on the poorer desert country sandy soils. 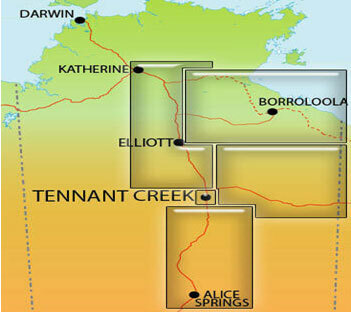 Tennant Creek township is home to a variety of clan groups. The main two are Waramungu and Walpiri. Most Aboriginal people in Tennant Creek speak some English. Of the Aboriginal languages spoken the main two are Warumungu and Walpiri. The other main languages in the region are Walmanpa, Alyawarra, Kaytete, Wambaya and Jingili.